Lars Vargö puts into context Japan’s succession issue after Emperor Akihito’s “abdication speech” last week. On August 9, in only his second ever televised address, the Japanese Emperor Akihito expressed his wish to abdicate. He did so in a very Japanese way: while not explicitly stating such, his mentioning of old age – he is 82 – and deteriorating health condition was a clear enough indication. The problem is that legislation enacted under the Imperial Household Law of 1947 does not allow him to abdicate. Yet the emperor in his speech also alluded to the fact that, under the current rules, an unnecessary “Imperial vacuum” would arise, given the stipulated mourning period upon his death and lengthy initiation rites for the new emperor. Abdication on the other hand, if allowed, would avoid such a vacuum, meaning his elder son, Crown Prince Naruhito, would be more quickly installed. The issue of abdication, however, is not the only legal quandary that Japan faces. Another is that the 56-year-old Crown Prince and Crown Princess Masako only have one daughter, Princess Aiko born in 2001. Article 1 of the Imperial Household Law stipulates that the “Imperial Throne of Japan shall be succeeded to by legitimate male descendants in the male line of Imperial Ancestors.” The 1947 law also states that succession is restricted to the immediate family of the emperor, in contrast to the time before that, when there were also four cadet branches of the Imperial Household from which a successor could be chosen. When it for many years seemed unlikely that a male descendant would be born within the Imperial family, lawmakers started to seriously look into the possibility of changing the law so that female descendants could succeed the throne. 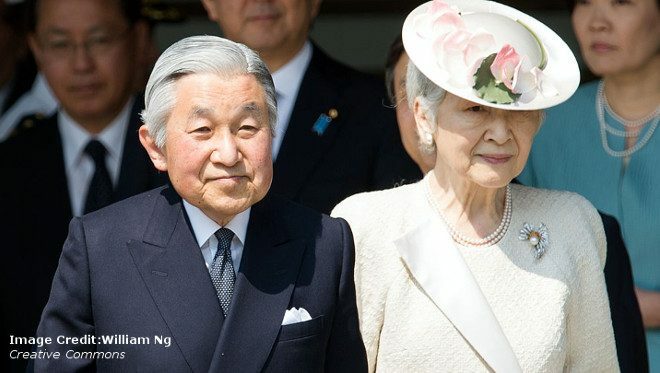 However, with the birth in 2006 of Prince Hisahito, the third child of Prince Akishino, the younger brother of the Crown Prince, both the discussions and the preparations for a change in legislation more or less ended. In fact, neither abdications nor empresses are new to Japan. Of the 125 emperors since the first, mythical emperor Jimmu, said to have descended from heaven in the year 660 B.C., nine have been women, the last empress being Meishô, who reigned 1629-1643. Thus, while women have been unusual on the throne, there are precedents. Noteworthy too is that the highest deity in Shintô religion is female, Amaterasu-Ô-Mi-Kami, who is the goddess of the sun and said to be the ultimate ancestor of the Imperial family. Furthermore, abdications have been many. In earlier history it was not uncommon for the sitting emperor to abdicate in favour of a child descendant while continuing to rule behind the scenes until the child came of age (a practice known as insei). The continued symbolic importance of the Japanese emperor remains unquestionable in modern-day Japan– hence the widespread attention accorded to the recent speech. According to opinion polls conducted after the speech, the majority of Japanese people are in favour of changing the law in order to make it possible for the emperor to abdicate. This would now appear probable if lawmakers prove sympathetic to his wish. It remains to be seen, however, whether legislation will be changed to allow for a tenth empress, once Naruhito departs the scene, to assume the throne. Dr. Lars Vargö is Senior Advisor at ISDP and former Swedish Ambassador to Japan.